Croatian Coldblood (Croatian: Hrvatski hladnokrvnjak, German: Kroatisches Kaltblut) horses are medium-heavy draught horses developed in Croatia. The history of the breed dates back to the first half of the 19th century, when it was begun to crossbreed local warmblood mares in central Croatia with imported quality stallions of Noriker breed. 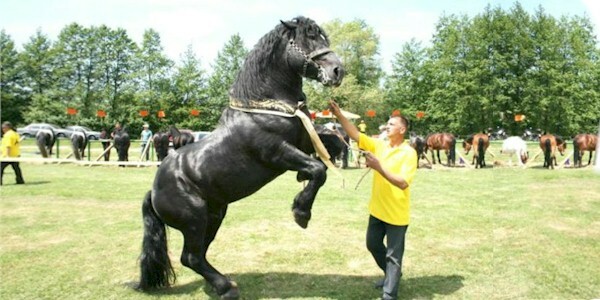 Some other breeds were involved later, like Ardennes, Brabant, and Percheron. At the beginning of the 20th century the breed was widespread toward east (Slavonia) and west (Gorski kotar and Istria regions). The typical Croatian Coldblood ranges from 150 centimetres (14.3 hands; 59 in) to 160 cm (15.3 h; 63 in) high. Stallions can weigh up to 850 kilograms (1,870 lb). Its head is medium-sized and refined, with small ears, but with large eyes and nostrils. It has medium short, arched and muscular neck, wide and deep chest, broad and muscular breast, as well as powerful legs with broad hooves. Most Croatian Coldbloods are bay or seal brown. Of the remaining horses, approximately 10-15 percent are black, and less than 10 percent are chestnut, gray, palomino, while the other colors are very rare. They are considered mild and obedient, easy keepers, willing workers and adapt well to various conditions and climates. Earlier, they were used for pulling wagons or for work in agriculture or forestry, but today they have lost their importance as draft animals and are being widely used for horse meat production.